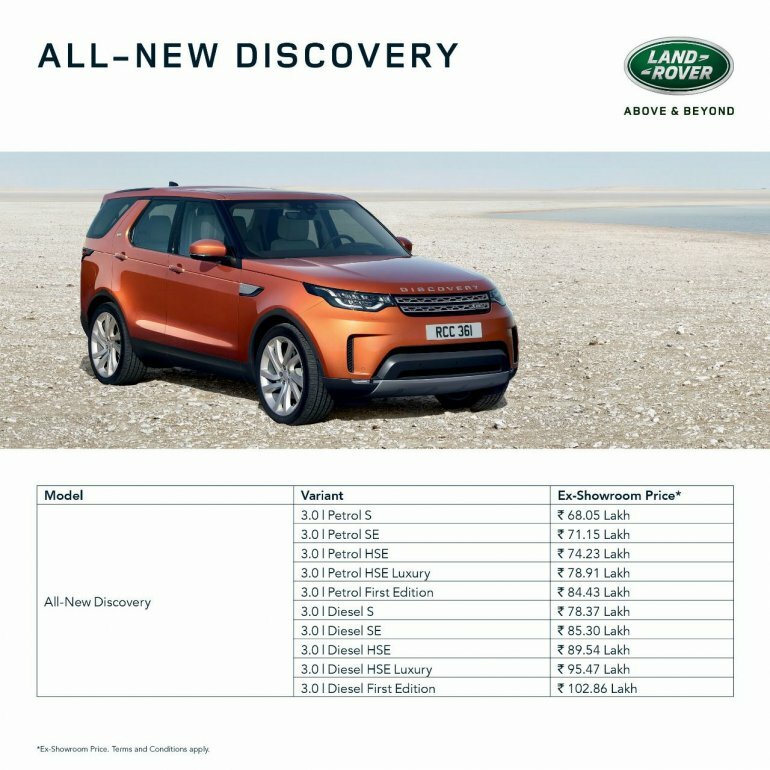 Update - Land Rover India has disclosed prices and standard specifications of the new Land Rover Discovery. 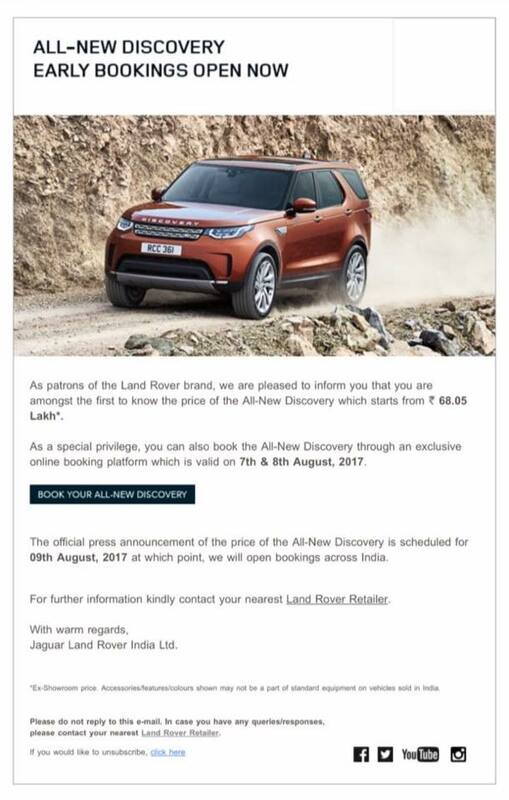 Land Rover has sent mails to prospective customers confirming that the 2017 Land Rover Discovery is priced starting at INR 68.05 lakh ex-showroom. Reader Aditya Singh, who runs the Jaguar Land Rover Enthusiasts & Owners - India Facebook group, has shared the emailer with IAB which invites select customers to book the car on 7 & 8 August. The company will announce the prices and open bookings pan-India on 9 August. Jaguar Land Rover India's Managing Director and President Mr Rohit Suri had earlier confirmed that the company will launch the 2017 Land Rover Discovery in India in October 2017. The 2017 Land Rover Discovery is the fifth incarnation of the nameplate. The third major redesign of the mid-size SUV gives it a softer and a more luxurious look than the previous model which featured a rather utilitarian design. The all-new Land Rover Discovery was previewed by the Land Rover Discovery Vision Concept in 2014. In India, the 2017 Land Rover Discovery will come with two engine options - 3.0 L Td6 V6 Diesel and 3.0 L Si6 V6 Petrol. The 3.0-litre Td6 V6 engine makes 258 PS and 600 Nm of torque. The 3.0-litre Si6 V6 engine puts out 340 PS and 450 Nm of torque. Both engines get an 8-speed automatic transmission and a four wheel drive system as standard. The Discovery will launch is S, SE and HSE, HSE Luxury and First variants with the above petrol and diesel engine. The 2017 Land Rover Discovery comes in 5 variants each featuring the 3.0-litre Td6 V6 diesel and 3.0-litre Si6 V6 petrol engines. 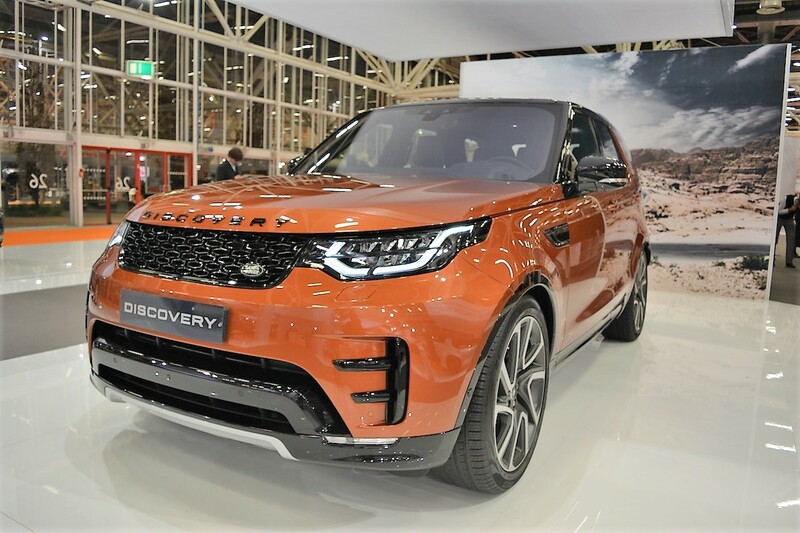 Noteworthy features of the all-new Discovery internationally are Adaptive LED headlights, LED daytime running lights, 22-inch wheels, LED taillights on the outside. Indoors, the features include full-glass fixed or opening panoramic roof, head-up display, 5-inch driver information display inside the instrument cluster, three-zone automatic climate control system, and configurable ambient lighting. Also on offer are heated and cooled seats along with massage function for the driver and front passenger’s seats, 10-inch touchscreen InControl Touch Pro infotainment system and 17-speaker Meridian audio system.